John Olsen is easily recognised as one of Australia’s most iconic and productive artists. An Australian legend and inspirational artist whose landscapes clearly reflect his intimate knowledge and feelings for the land. Five Bells, oil painting 1973, New South Wales Art Gallery NSWAG in Sydney, Australia. A lovely painting, with its bold blue brilliance against the starkness of the white background and seen in person – its just stunning! Viewing his paintings, you can sense the timelessness of the land. Olsen conveys with ease the spirit of the land. He isn’t tied to a rigid western format but has a fluid interpretative and expressive approach. He paints with passion, feeling and sensitivity. Olsen goes beyond a narrow traditional approach, into what I might term, a wholistic approach. Looking at the landscape, at the environment from a much wider perspective. Personally, what I’ve distilled from seeing Olsen’s paintings is the feeling of seeing the bigger picture. And this, gives me a greater awareness of how all earth’s elements relate and communicate and depend on each other. How we are all connected. A very good thing to pause and reflect upon. Australian Flux, this detail of the painting highlights the intricate layerings and patterns that went into creating the depth of the image. The bright blue orbs draw the eye while the smooth blue grey, pastel sky shape serves as a calmative to the piece. Dr. John Olsen was born in 1928 in Newcastle, NSW, Australia. He travelled abroad into Europe and Africa. He returned and travelled extensively throughout Australia gaining sensitivity and insight into this ancient continent, which is so apparent in his paintings. Nearly all of his works are landscape themed, reading maplike or from an aerial viewpoint. A creative, clever and inventive artist Olsen is adept at not just oils, but printmaking, ceramics, tapestry, gouache, watercolours. Clearly, he’s not an artist that is content to be boxed, pigeon holed into creating only one form of work to just please others! He has won the sought after Archibald Art Prize, the Wynne Prize and the Sulman. Olsen’s paintings are found in the state galleries, the NSWAG (New South Wales Art Gallery) and the Olsen Irwin Art Gallery in Sydney. All of John Olsen paintings are exquisite in their colour sensitivity, the mark making, textural layerings, and beautiful tonal nuances. What you will find in every work John Olsen has done – is a great clarity of abundant tonal values. There is no muddle of flatness. There is clear evident Light tones, Mid tones, and Deep Dark tones within his paintings. I love this about him! While I have only chosen just the two to showcase, if you visit Olsen Irwin art gallery and NSWAG you will get a much broader and exciting view of his more of his inspiring work. I have to say, between two Australian artists, Fred Williams and John Olsen, I could not pick who would be my ultimate favourite. For over 20+ years, I’ve danced between the two. I love them both. I’ve included my painting Mountain In Blues, as it is one that I feel most reflects the Olsen influence upon me. Have a look at my Gallery page and I’m sure you will see more of that influence on my work. What’s Blooming in Your Garden, Today? Where I can get John Olsen? you’re welcome Laura, always my pleasure to share John Olsen with others!! He is fabulous 🙂 glad you enjoyed it too ! 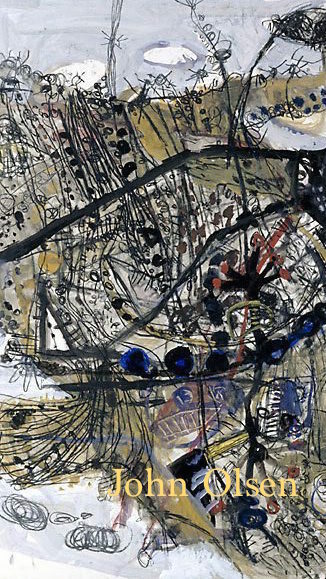 Thanks for sharing John Olsen’s dynamic art work. I can see why you are inspired. 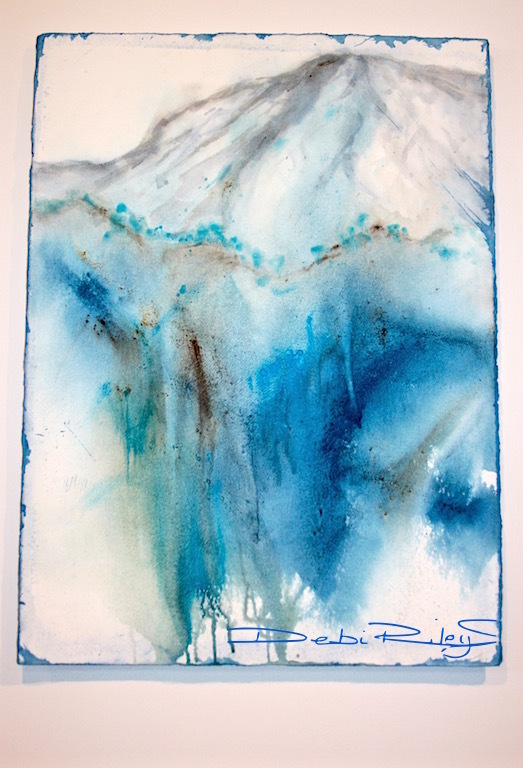 Your Mountain in Blue painting is exquisite. I also reviewed your gallery and I’m very inspired by variety of paintings. I enjoy your posts Debi, and appreciate the knowledge that you pass on. 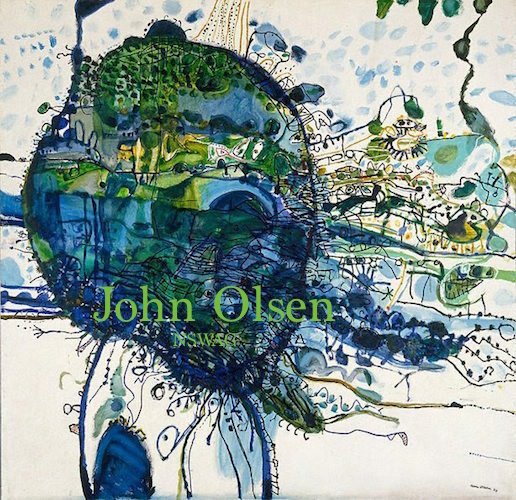 Hi, thanks for introducing me to John Olsen’s art in such a fascinating, detailed and passionate way!! It’s really intriguing to get to know it! You’re welcome Pawlo! its my pleasure to share John O around, lol. Debi….your Fred Williams link on your post here is a “not found” link…. I will have a look again. It worked the first time round, but… me and computers! 🙂 lol ps, try again too!